The Parsis first came to Gujarat on India's western coast from Persia. Though not a large community, they have since become very influential in the country. When discussing the Parsis one cannot ignore their food as it is both delicious and unique. Parsi food combines both Persian and Gujarati Influences. Parsi chicken farcha is a popular Parsi dish often served as a starter or appetizer at festivities of all kinds- from weddings to birthdays to family dinners and more. It is extremely easy to cook and often called the Indian version of American Southern fried chicken. Cook and serve some at your next gathering, or for a home-style family meal with a special twist. Put the chicken in a large non-metallic mixing bowl and add the lemon juice, garlic paste, ginger paste, red chili powder, garam masala powder, pepper and salt to it. Mix very well so that the chicken is thoroughly coated with the marinade ingredients. The longer you marinate the chicken, the tastier your Chicken Farcha will be, so overnight is perfect. If that is not possible, marinate for at least 30 minutes to an hour. Cover the mixing bowl with cling wrap and refrigerate to marinate. 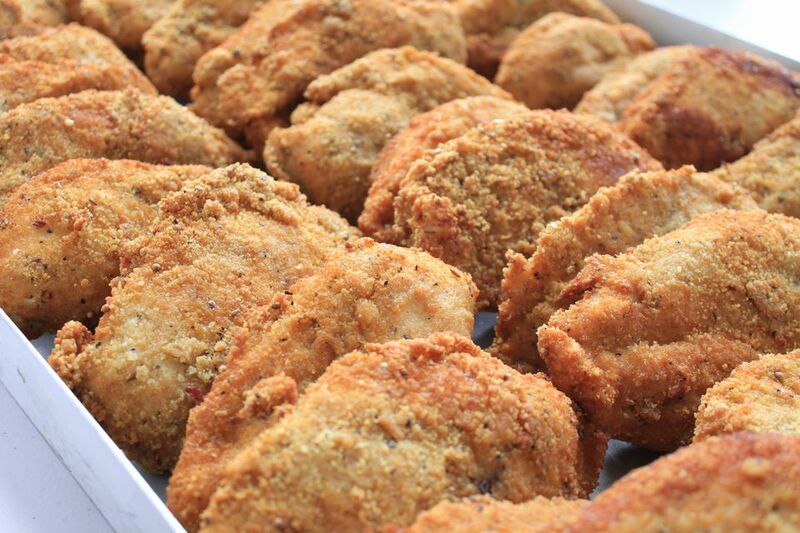 When you are ready to fry the chicken, prepare the coating ingredients by laying them all out. Start by laying the breadcrumbs out on a flat plate. Heat the vegetable/canola/sunflower cooking oil in a deep pan/ wok/ kadhai, on medium heat. Do not be tempted to raise the temperature. You do not want the oil to be too hot as this will cause the chicken to burn on the outside and remain raw on the inside. Crack the eggs into a bowl and whisk until smooth. Now add the salt to taste, freshly ground black pepper and the pinch of red chili powder. Whisk again to mix well. Take the chicken out of the refrigerator and mix well again. When the oil is hot, roll each piece of chicken in the breadcrumbs to coat well. Dip each piece in the whisked egg mixture and gently drop into the hot oil. Depending on the size of your pan you can fry more than a piece of chicken at a time, but do not crowd them. Use a slotted spoon to remove from the oil and drain on paper towels. The chicken is not meant to be very crispy on the outside. When all the chicken farchas are fried, serve hot with a green salad or roast vegetables.